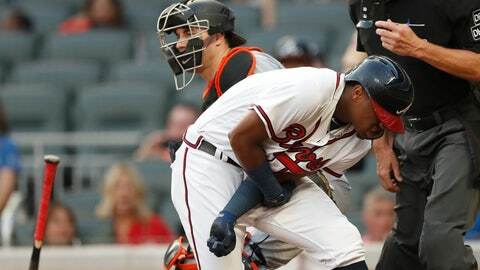 ATLANTA (AP) — Ronald Acuna’s chance to extend his three-game streak of leadoff homers was put on hold when the Marlins‘ Jose Urena hit him with his first pitch on Wednesday night, triggering a melee that led to benches and bullpens for Atlanta and Miami emptying twice. Urena’s fastball hit Acuna’s left elbow, leaving Acuna in obvious pain. Trainer George Poulis hovered over Acuna, who sat on the ground near the batter’s box while players swarmed near the mound. Urena’s fastball was timed at 97 mph. But Acuna’s stay was short-lived. He left in the top of the second, walking off the field after taking his position in left field. Snitker said Acuna’s forearm was cramping when he left the game in the second inning. The 20-year-old Acuna entered the game on a rare power streak. He hit two homers in Tuesday night’s 10-6 win over the Marlins. He became the first player to hit leadoff shots in three straight games since Baltimore’s Brady Anderson led off with homers in four straight games in 1996.